I peeked at the SCS sketch last night before I went to bed, then had a hard time falling asleep. I was thinking of different images I could use with this weeks sketch - ever have that happen? I took a bit of creative liberties and rotated the sketch to fit the images I wanted to use. I used my Stamp-a-ma-jig to stamp the branch from Thoughts & Prayers on my Baja Breeze card stock. This made it easier to see where to connect the branches without overlapping them. 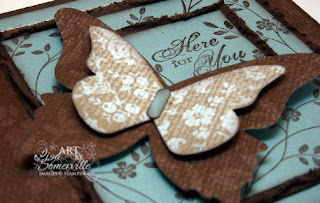 I sponged the edges with Chocolate Chip ink, then used the Torn Edges Technique with my Chocolate Chip panel. I stamped the sentiment from Friends 24-7 on my Baja Breeze panel, then used my SAMJ to add some of the branch pieces from Thoughts & Prayers. This piece was also sponged, and the Chocolate Panel done with the Torn Frames Technique. 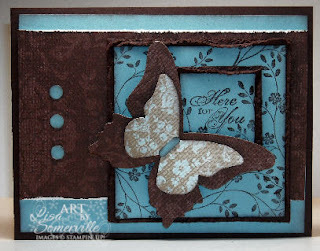 I cut the Butterfly from Parisian Breeze Speciality Paper with the Sizzix Butterfly Die, added the body piece with a piece of Baja Breeze card stock punched with the Horizontal Slot Punch. The Butterfly is then popped up on dimensionals. This is sooo beautiful, Lisa!! Love how you flipped the sketch and that fab butterfly!! superb, spledid! delightful, divine, elegant, enticing, excellent, exquisite! (i needed to stop saying "wow"!!! I am starting to get boring! LOL!